I enjoyed this episode a lot! LaRanaRene, scooterfan360, ploobis and 1 other person like this. Some where on the internet there is an interview with Kristen Newman. She talks about her vision for the show, and this one felt like it was one that was before the reboot. To much talking, not enough jokes. At any rate I hope next weeks show will do better. I don't think this show will get axed. Agents of Shield, Agent Carter, and Galavant had the same low ratings as The Muppets, but because of fan support ABC still renewed them for another season. 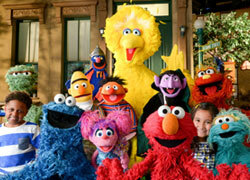 The Muppets will probably be the same way, where ABC gives it another season, because of fan support. Overal, this episode was a bit of a downer for me, and I just don't like this reboot. Couldn't ABC wait 10 episodes for a show to get on the right track, can an audience wait for a show to evolve, no they walk out by episode 3, and the show is getting better, but no one is watching it. There's potential, and I liked the first episode of the reboot (still didn't see the second, should be available today). I like the idea of the brand manager trying to have the show fail, and I like that they addressed the problems with the show head on. The Piggy storyline seems like something that they had all along and shoved the Piggy show and brand integration episodes in there to conform it to the new flow of the series. I really think as far as story goes, they should have pushed the Pizza seduces the writers plot line further. Seems like there was real potential in having the writers slowly revolt at Kermit, causing the show to be sabotaged. Something sort of like the plot of MMW, only Kermit's there the whole time and feels the betrayal. I do like how Kermit was able to flip everything against Pizza. I just wish they did more of that and split the two plotlines up into separate episodes. Still, if this is one misfire among the better episodes, it's a misfire. Like the episode with Scooter and Chelsea Handler. It came in the middle of a strong run of episodes. Comparatively better than the start of the series, but not as strong as the episodes it was in the middle of. And we have to admit, sometimes shows are like that. One weak episode every so often. Two thoughts Gonzo just looked off for most of the show.and the show seemed shorter then normal. Yeah. I've noticed that too. Heck, they didn't even use the opening. They just updated that a few weeks ago and now they seem to be getting rid of the whole thing. Plus they didn't even touch on the Gonzo/Camilla plot. She came back last week and now they seem to have forgotten about it. Maybe it's a production error issue. Oh, well. At least nobody sang about curse words this week. GRRRR! Over all I really liked it. I am a bit sad that most of the Kermit/Denise break up is happening off screen. Yeah. That would have been nice if we had seen more of that. I thought it was nice that Denise stepped aside so there would be more of a chance for Kermit and Miss Piggy to get back together, but having Denise still be around would be interesting as well. It would sort of create a love triangle that would spice up the plot. But there is a sweet payoff to the Piggy/Deadly story line. Yeah. That was nice too. Though it would have been nicer if it had been Piggy and Kermit, but with Piggy/Deadly it seemed to work. I'm just hoping they don't hook up as a couple though. That would just be wrong. Lol. But it was nice to see Piggy's soft side. I know we've had issues about her fladerization in recent years, so this episode sort of addresses these issues. Now it seems like she does think of the other Muppets as her friends contrary to what she's said in the past and she's realizing on her own that she can be hard to like at times. Overall, this was a good Miss Piggy episode. I debated for about a minute over whether to vote "good" or "so-so" for this one, because I definitely didn't find it the funniest or best-written episode of the series (not by a long shot). The puppetry in the aerial-silk segment was marvelous. Mrs. Otter and I were ooh-ing and ahh-ing about that one for quite awhile. Not just the flying-and-falling-Piggy parts, but also Piggy's gloved hand shushing the dental hygienist. 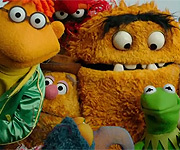 That entire scene represented some of the best uses of puppetry in the whole show (which is saying a lot because there has been some AMAZING puppetry in this series). I found Pizza/Pache's scenes to be better-written this time around and I liked Kermit asserting himself against him early in the show and then outwitting him to allow the RuPaul/Muppet fashion show to proceed. If Pizza/Pache winds up being nothing but an infrequent comic foil for the Muppets at this stage of the series, I'm fine with that. Also, I was curious about Kermit's phone call to Denise and then the rather heartbreaking scene with her box of his stuff on his desk while Kermit's voiceover suggested that at least Rizzo was having better luck in the romance department. Not a bad way for the writers to draw that storyline out without giving it too much prominence. And while I only got to see about 10 minutes of "A Tail of Two Piggies" (we live in Atlantic Canada so our ABC affiliate showed the New Hampshire primary and we aren't permitted access to the streaming services because we don't live in the U.S.), I feel like the writers could have tried some continuity from that episode, particularly with the Gonzo-Camilla plotline. Footnote: After hours and hours of deliberation that kept me up well into the night, I have finally decided that I don't mind the opening theme being reduced to the title card. I missed that jazzy Hammond organ but if that means more fresh Muppet content, no problem. ploobis and Drtooth like this. Still, with all of that, I felt like this episode was missing some energy and commitment from the writers and producers. Not the Muppet performers; they did the best with what they were given (and I credit RuPaul for gamely carrying on with his material; I actually laughed at the "Christmas underwear" joke). I just felt like we could have gotten more out of the concept of Gonzo, Rizzo and Pepe being taken suit-shopping (Pepe's end-credits bit was close), or a Muppet fashion show, or even Fozzie and Lew Zealand testing a sketch on Bobo. I really like the idea of Pizza going behind Kermit's back, but it really felt like there was so much more they could do with it, and it really should have had more energy. Seems to me like whatever traction the story could have was cut for time to fit things in. I do like the new skit and song at the end format, but there's clearly a juggling act they need to perfect here. Personally, I'd love to have seen Kermit grimacing at the script for the Pinkberry skit after reading it. Even if it gave Pizza essentially the same role as Dominique Badguy and Constantine, I really wish the script had more room for the staff to be wooed into doing the show the execs wanted them to do. But yeah, massive credit to the performers on every episode. The writing quality is debatable, but it's not like we're getting passionless, wooden deliveries from the characters. The Gonzo/Pepe/Rizzo chemistry made their segment better than it should have been. And I totally want to see more of Rizzo hitting on Yolanda. I'll also agree about the continuity. Seems only a few things really get the continuity they deserve. This is the show for them to have that as the original show was episodic. While I'm mixed about the Denise break up and mixed about how it's subtext, Steve is really doing a bang up job giving the frog the emotion he was lacking in the earlier years of having the character (though I think most of that was goaded by the producers of those projects). It's these little moments that stick out. Subtlety and subtext. Kermit's expressions during this break up are actually pretty heart wrenching. mr3urious and JimAndFrank like this. Seems like the writers are still trying to get a handle on the retooled format just as they were with the format at the beginning of the show. Ok I am split about this episode. Uncle deadly and miss piggy's subplot was heartwarming and I loved it. It was really adorable. ad the plotline with rizzo and gonzo and pepe... eh... No thanks. I really wish they'd stop putting pepe and rizzo in plotlines because I can't STAND pepe. By the way I think this episode and the tail episode might have been out of order. It's quite amazing how skinnier Muppet arms can be raised without the rods being shown. You'd be crazy not to acknowledge and appreciate the technology they've been utilizing. Where did you find info on the ratings? I'll also agree about the continuity. Seems only a few things really get the continuity they deserve. This is the show for them to have that as the original show was episodic. Yeah. Like I said, the fact that the plot wasn't touched on in this episode may have something to do with production order. This ep could have taken place before Camilla returned, so it's possible they might touch on that again. We'll see what happens with that. If that head isn't generous to The Muppets, I'm hoping he's not generous to that GAWD-awful Last Man Standing show either. How the heck does that keep getting renewed? Even the cast of TTG isn't that unlikable. It seems like a refugee from the terrible 2001 ABC line up. I am also loving Uncle deadly in this series. He had such a small role in TMS and now he's gotten much more to do and he's such a scene stealer. Can we have a Uncle deadly emoji for here soon? Pretty please. and I am glad camilla and gonzo are getting scene time again. I must admit I didn't catch last weeks episode because I thought they were having some face the nation special report or something so I binge watched the two episodes one after the other. I really hope those two become a thing again. It seems Gonzo is never himself when she's not around. She completes him. And Matt Vogel has really made that character his own. Ditto Dave Goelz as Chip.